New Delhi: With nearly one in six elementary school teachers not professionally trained, India must improve its spending on teacher training--just 2% of the 2018-19 budget allocated for Samagra Shiksha Abhiyan (‘holistic education programme’) was spent on teachers’ training institutes. The projected budget allocation for the programme for 2019-20 is estimated to be Rs 34,489 crore, an increase of 10.5% from the 2018-19 budget estimate, according to a medium-term expenditure projection statement presented to parliament in August 2018. 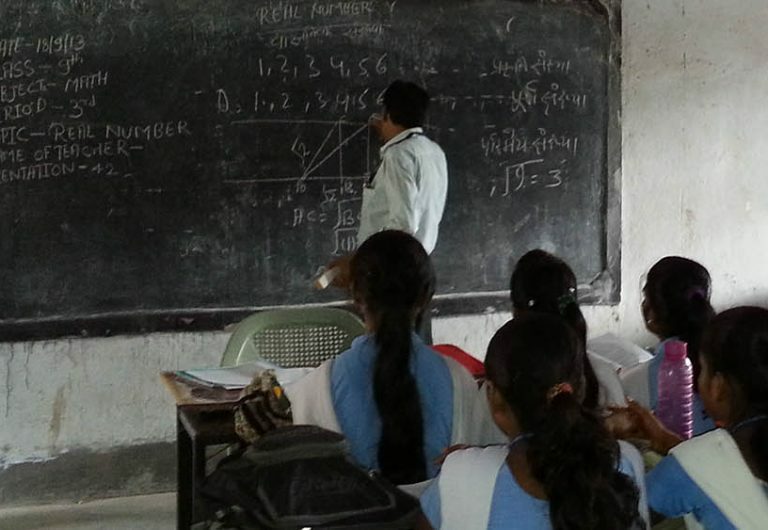 Launched in 2018 by combining Sarva Shiksha Abhiyan (‘education for all’), Rashtriya Madhyamik Shiksha Abhiyan (‘national middle education mission’) and teachers’ education programmes, Samagra Shiksha Abhiyan aims to provide support for both pre-service and in-service teacher training. Teacher training is imperative for improving learning outcomes in Indian classrooms, as acknowledged by the Three Years Action Agenda of the government think-tank NITI Aayog, as well as in the 2018 budget speech that emphasised on the need for professionally qualified teachers for school education reform. Only half of 10- to 11-year-olds in India can read a grade II level text (appropriate for seven- to eight-year-olds), as IndiaSpend reported on January 25, 2019. In rural India, almost half of grade V students cannot read a grade II text and more than 70% them cannot carry out simple division. A common feature across the Indian education system is shortage of qualified teachers. Section 23 of the Right to Education Act of 2009 (RTE Act) mandates that all government school teachers should possess minimum qualifications laid down by the National Council of Teacher Education. Under guidelines released in November 2010, those not qualified were given time until March 31, 2015, to complete their training. Yet, in 2015-16, of 6.6 million teachers employed at the elementary level, 1.1 million were untrained. Of these, 512,000 were in government and aided schools and 598,000 in private schools. At the secondary school level, of 2 million teachers, around 14% were not professionally qualified, according to data from the education ministry. Large proportions of untrained teachers--both at the elementary and the secondary level--exist in West Bengal (40.8%), Bihar (36.6%), Jharkhand (16.5%), Uttar Pradesh (13.2%) and Chhattisgarh (10.5%). Teacher training is a continuous process, with pre-service and in-service training being its inseparable components. In March 2017, the central government amended the RTE Act by extending the timeline for teacher training from 2015 to 2019. The expenditure on strengthening teacher training institutes has increased from Rs 326 crore to Rs 550 crore in the last 10 years. In 2016-17, the central government brought the teacher training programme under the umbrella of National Education Mission (NEM). Yet, the share of teachers’ education budget in school budget has consistently declined from 1.3% in 2009-10 to 1.1% in 2018-19 (budget estimates), showing that teachers’ training has been accorded low priority. The situation is similar in states. Uttar Pradesh, Chhattisgarh, Bihar and West Bengal, states with large numbers of professionally unqualified teachers, are not even spending 1% of their school education budgets on teachers’ training, according to this 2018 study by the Centre for Budget and Governance Accountability. After the 14th Finance Commission recommendations, some states such as Bihar and Chhattisgarh increased the share of spending on teachers’ training, yet it remained at 0.001% in Uttar Pradesh and 1.3% in Bihar. Both the central and state governments have failed to spend enough to create institutional capacity for teacher training, which is resource-intensive. As a result, the District Institutes of Education and Training (DIET), the nodal agencies for teacher training and curriculum development, have failed to fulfil their roles--government data in 2018 showed that more than 35% academic posts in DIETs were vacant. DIETs’ performance is reflected in the results of the Teachers Eligibility Test (TET) for teacher recruitment started in 2011 under the RTE Act. CTET results for 2018 showed that only 17% of 1.7 million candidates qualified as primary school teachers and 15% candidates as middle school teachers. The private sector has stepped in to meet the growing need for diplomas and undergraduate degrees in elementary education, to the extent that 90% of teacher training institutes in the country today are in the private sector. Over time, the government has addressed the issue of untrained teachers mostly through in-service teacher training under SSA and RMSA. These centrally-sponsored schemes only provide the running cost for refresher courses, which amounts to as little as Rs 100 per teacher per day under SSA and Rs 300 under RMSA. The SSA programme itself is severely under-funded, as the education ministry has allocated a small proportion of its committed funds to state governments. For instance, in 2016-17, Rs 46,702 crore were approved but only Rs 22,500 crore actually allocated as the central government's share of SSA, less than 50% of the approved outlay. The central government’s allocation for the scheme depends, to a large extent, on its collections of education cess. In the last five years, more than 60% of the SSA budget has been financed through this cess. The financing of education being dependent on variable collections of cess every year makes the allocation for SSA, and thereby, teacher training uncertain.